Pittsgrove, NJ, November 6, 2018. 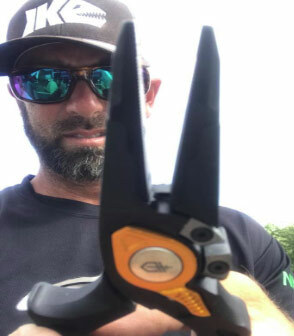 Professional Edge Fishing, Inc. has announced a partnership between Bassmaster Elite Series angler and host of the Nat Geo WILD series Fish My City, Mike Iaconelli and Gerber Gear, makers of rugged, problem-solving tools. Iaconelli joins the formidable Gerber Gear team of Badassadors that includes other boundary pushing outdoor adventurers. Appropriately named, a Badassador is an outdoorsman or woman “doing whatever it takes, even if that’s everything you got; finding out you have more inside than you thought; out there in the woods and swamp and sea, in it; the act of being Unstoppable.” This description defines Iaconelli who hasn’t paused in an adrenaline driven fishing career spanning over 20 years. He is the only angler to have won the Bassmaster Classic, Angler of the Year and B.A.S.S. Nation Championship. He is host of the webcast Ike LIVE, co-owner of The Bass University and most recently, star of Fish My City with Mike Iaconelli on Nat Geo WILD. But at the core of it all, Iaconelli is a passionate fisherman who has traveled the globe for over 100 species of fish. Iaconelli has fished in lakes, ponds, and oceans as well as canals and sewer drains in urban cities. The latter is explored in the new Nat Geo WILD series airing Fridays at 10pm EST/9 CT.
Bassmaster Elite Series pro, Mike Iaconelli, holds the longest active streak as a Bassmaster Classic qualifier of 18 years. He’s also the only angler to have won all three of Bassmaster’s most prestigious titles: Bassmaster Classic, Bassmaster Angler of the Year, and B.A.S.S. Nation Championship. Iaconelli is the host of the ‘Going Ike’, the ‘Ike LIVE’ webcast and founder of The Ike Foundation®, a nonprofit whose mission is to introduce urban kids to the sport of fishing. Gerber Gear joins Iaconelli’s other partners that include: Toyota, BassCat, Abu Garcia, Berkley, Flambeau, Tackle Warehouse, Hobie, Yamaha, RAM Mounts, NINES and Renegade, Lowrance, Power-Pole, Reelsnot, Molix, Missile Jigs and VMC. Visit Mike Iaconelli's website, or follow him on Facebook, Twitter & Instagram. Gerber is a leading global supplier of activity specific knives, multi-tools and problem-solving gear. Built on the pillars of craftsmanship, innovation, and an unrelenting commitment to quality and service to others, the trusted brand features a diverse portfolio of equipment for recreational and professional end users. Visit Gerber Knives, Multi-Tools, Cutting Tools & Equipment, or follow them on Facebook, Twitter & Instagram.